A wine label is a message ON a bottle. What’s outside the bottle counts, too. It is the beginning of a story, a preamble to what’s inside. As I said in previous posts, a label is a major factor that influences our decision to buy or pass. In some cases, it can also create a preconceived idea of the wine quality, and affect how we enjoy the wine. Marketing folks from around the world are fond of playing up historical bottling artifacts – deep punts, wax seals, etc. – to make their bottles convey some kind of a timeless quality. They know how to turn an unsophisticated wine bottle into the Shangri-La of wine bottles with the help of a little “makeup”. It is a compelling mix of playful art and serious science. Here is a list of the most common wine “cosmetics”. • Foil – a protective sleeve also referred to as a capsule (Orig. French). It is mostly used to protect the cork from being gnawed away by rodents or infested with the “cork weevil” (some sort of annoying beetle), and to serve as a collar to catch small drips when pouring. Foils used to be made of lead but we all know that’s not good for us. Well, we know now! Lead foil bottleneck wrapping were slowly phased out starting in 1990. In the US, the FDA officially banned lead foils on domestic and imported wine bottles as of 1996. Nowadays, they are made of tin, aluminum, or heat-shrink plastic. In some cases, sealing wax can also be used, and the foil can be omitted entirely. As a counterfeit measure to prevent from refiling the bottle with a cheaper wine, some bottles of wine have a paper strip beneath the foil, as a seal of authenticity, which must be broken before the bottle can be uncorked. Another method used by the Opus 1 winery (Robert Mondavi) is a unique patented ink used on the capsule that will indicate whether the capsule has been replaced. Smart! • Thin wire mesh – Also known as red (net) the wire mesh wasn’t always just for looks. Its historical purpose was to fight against counterfeit and theft, just like the capsule. The wire would prevent unscrupulous people from drinking the content, refilling the bottle with a cheaper wine and sell it at a higher price. Today, the “red” is solely decorative. It’s the bling-bling of wine bottles. • Gold borders, lettering and graphic elements – Gold symbolizes power, strength, and perfection. It is associated with notable anniversaries, particularly in a 50-year cycle, such as a golden wedding anniversary. Let’s not forget the golden pocket watch and its fastening golden chain, two classic accessories of the oh so enviable “bourgeoisie”. Need I say more? – Be ready for a complete overall because I am definitely adding gold to my blog! • Embossing and texture – Make it pop! Two dimensional images are so boring. We live in the age of 3D and high quality audio (I should know). Anything embossed on the label (or on the glass) shows a additional level of sophistication and care that the consumer loves. It is definitely more expensive to manufacture those labels but they do make a difference in final sales. • Visual depth and details – Don’t underestimate the power of graphic design! They make a enormous difference in the wine’s popularity. After all, it is the first thing you see before you can taste the wine! Unless you have access to the wine before being bottled and that’s a treat of its own. A layered design behind the brand’s name expresses class and style. It shows attention to details and a special effort dedicated entirely to the brand. 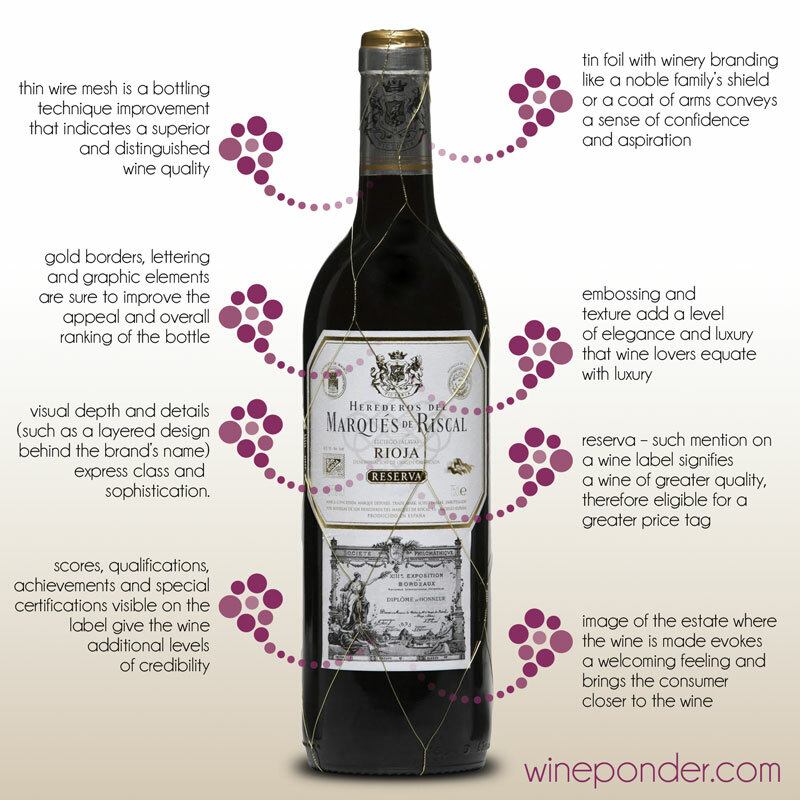 • Reserve – The “Reserve”, “Special Reserve”, “Private Reserve” or better yet “Grand Reserve” mentions on a wine label is supposedly a wine of greater quality, therefore eligible for a greater price tag. The term “Reserva” on a bottle from Spain or Portugal, or “Riserva” from Italy, indicates a wine made under a particular set of regulatory parameters, mostly referring to the time it was spent in barrels before release. • Scores & qualifications – Credentials is everything! Got something cool to share? Put it on the label. It includes being a member of a well-known organization (preferably in the wine industry), winning first place in some high-rated “foofy” French competition or blind taste, or even proudly displaying a biodynamic farming and winemaking practice. Those special achievements show the winery’s devotion to make the best possible wine. It puts the consumer at ease and builds confidence. • Image of the estate – A high percentage of wine labels feature the estate or château, mostly because it looks good and it reveals a sincere and committed vocation to the land. Showing where the wine is made evokes a welcoming feeling and brings the consumer closer to the action. Keep in mind this is all artificial and cosmetic. Obviously, the quality of the wine is what you want it to be. Don’t let the outside influence the inside. Taste is highly subjective but it is up to you. The outside is just a fun game of enticement and seduction, only to attract you, the consumer.